Luna Yu is passionate about not wasting food. “I was taught at an early age by my grandparents never to waste food since it was throwing away the hard work of farmers and food producers,” says Yu, a recent graduate from the Master of Environmental Science program at the University of Toronto Scarborough. 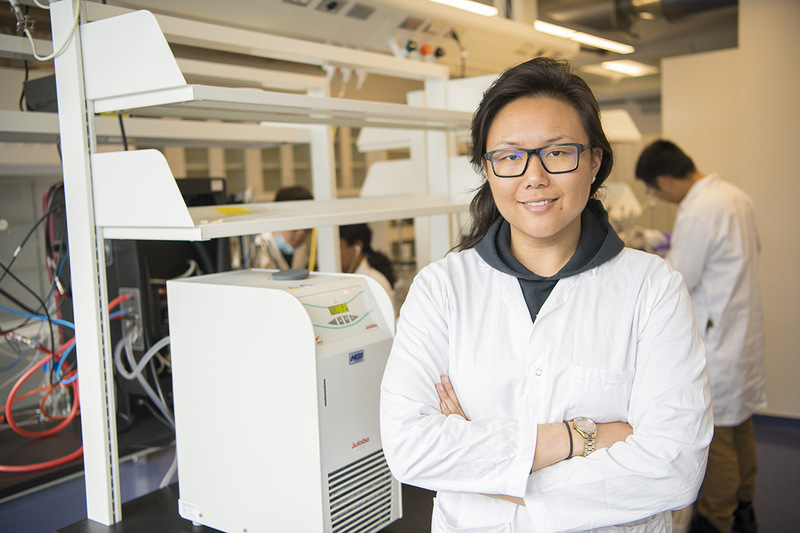 It’s no wonder that passion led Yu to team up with a talented group of scientists and engineers – many of whom are U of T students or recent graduates – to form Genecis. The company uses recent advancements in biotechnology, microbial engineering and machine learning to take food destined for the landfill and convert it into PHAs – a high-quality, fully biodegradable form of plastic. It’s not Yu’s first foray into entrepreneurship. She worked at a software company as an undergrad before moving to another startup that converted restaurant food waste into biogas. It was there she met several talented engineers, learned about the microbiology of converting discarded food into other materials, and discovered a valuable lesson in the economics of recycling food waste. “Converting food waste into biogas is time-consuming process and the end product is fairly low value,” she says. After connecting with a fellow environmental science student in The Hub, U of T Scarborough’s entrepreneurial incubator, they started looking into what else could be made from food waste. PHAs, or polyhydroxyalkanoates, are polymers produced by bacteria that have many benefits over other forms of bio-plastics, explains Yu. For one, they can be a thermoplastic, meaning it can be easily moulded and remoulded into different products. Another benefit is that, unlike many other forms of bio-plastics, it won’t ruin the recycling process. “Many people throw bio-plastics into the recycling bin rather than the compost, but if it’s not a thermoplastic it can’t be remoulded and this disrupts the physical properties of new recycled products. They will end up falling apart,” she says. PHAs won’t cause this problem if they accidentally end up in recycling bins, making them much easier for waste management companies to handle. But what really sold Yu on the benefits of PHAs is the fact that they’re fully biodegradable. PHAs degrade within one year in the environment, and fewer than 10 years in water. Synthetic plastics can take hundreds of years to degrade in similar environments. While PHAs can be used to make pretty much anything out of plastic, Yu says the ones made by Genecis are best suited for higher-end, multi-use products like toys, flexible packaging, 3D-printing filament and medical applications including surgical staples, sutures and stents. Genecis uses a three-step process to create their PHAs. First, a bacteria culture breaks down the food waste into volatile fatty acids.The fatty acids are added to another bacteria culture specially selected to produce PHAs in their cells. Finally, an extraction process breaks open the cells, then collects and purifies the plastic. The entire process takes seven days. “Making biogas, on the other hand, takes an average of 21 days,” Yu says. The company’s main lab in U of T’s Banting and Best Centre for Innovation and Entrepreneurship houses pilot-scale bioreactors that can complete the three-step process. The other location in the Environmental Science and Chemistry Building at U of T Scarborough is responsible for research and development in looking for ways to optimize their production process. When Genecis opens its demonstration plant with an industry partner later next year, it will be able to convert three tonnes of organic waste into PHAs weekly. In less than two years of existence, Genecis has already won more than $330,000 in prize money from startup competitions. Yu says the support, guidance and mentorship they’ve received from The Hub, the Creative Destruction Lab, and the Hatchery, a startup accelerator at the Faculty of Applied Science & Engineering, have also been instrumental in their growth. As they aim to ramp up production, Yu says this support and the lessons learned from her work in other startups will be invaluable. “Our goal is to create the highest value from organic waste,” says Yu, adding they have cultured and isolated hundreds of species of bacteria that currently don’t exist in databases. “Soon we will be able to synthesize speciality chemicals and other materials from organic waste, all at a lower cost than traditional production methods using synthetic biology,” she says. Those specialty chemicals can be used in a range of products, including those found in cosmetics and the health and wellness industry, says Yu.